2 by 3 Heroes: Tis the Season: Would you take my friggin' minis already!? Tis the Season: Would you take my friggin' minis already!? OK, before we get to the first giveaway of the season, I forgot a couple things on my Black Friday post yesterday. Yes, I did get a full base set out of the Masterpieces. I did a breakdown of the two boxes. Box 1 had a total of 94 cards, 6 were dupes within the box. I had the one brown frame Clemente numbered 35/100 and the Reyes relic. The box also had one damaged pack with 5 cards. Fortunately, all the damaged cards were duped in box 2. Box 2 has a total of 91 cards, 4 were dupes within the box. I had three color frames - red Gwynn, black Bruan, and blue Reyes numbered 24/50, plus the Ramirez relic. When I combined the boxes, I came out with a full set of the 90 card base. Of the 30 short prints, I received 10, leaving me to find 20 SPs. 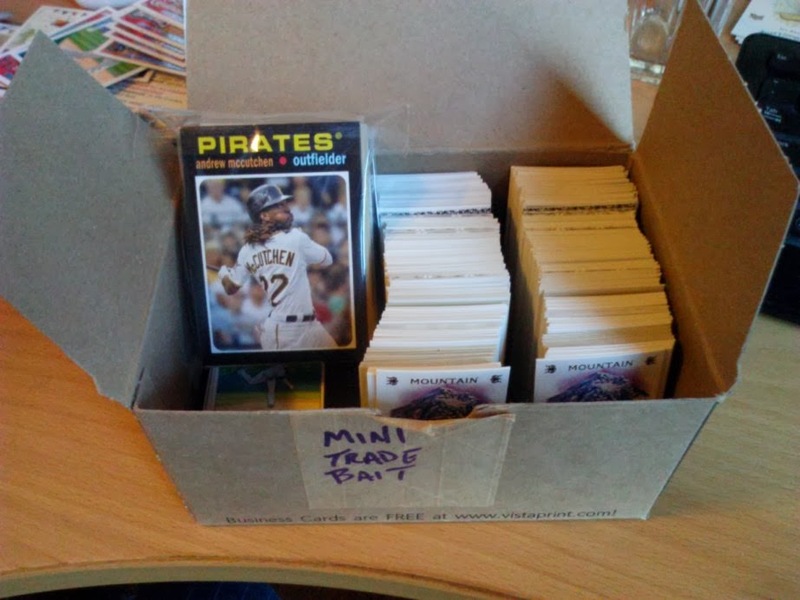 I also has a stack of dupes which I will probably throw in with the card dump, so sign up. Ok - on to the business at hand. If you have been coming here for a while, you recall the "Take My Minis" link at the top. It's gone, right? So is the "Take My Parallels". The parallels are going to go out in packages with the card dump as well (see - you REALLY should sign up). For you noobs and those with a short memory, I bought almost a thousand minis from my LCS a while back. I have been slowly trading off what I can, and frankly, let's just dump the rest. So I took what was left and separated it into to piles. It's the two you see on the middle and right of that picture. I did my best to not have dupes in the piles, so you should get a nice mix of Ginter, Ginter inserts, Ginter borders and backs, Kimballs and some Golden Age. And no, the mini of McCutchen is not there for show, he and his partners in the bag are also going to bigger and better places. In that bag is a stack of 30 or so of the 87/71/75 minis Topps has put in their recent releases. I liked them, but it's way too daunting a task to collect the sets. I think there are just two of the 71s in there and the rest is a mix of the 75 and 87s. Your mission, if you choose to accept, is to pick a number. Not just any number, mind you. Here are three gold parallels. The Frieri is for the McCutchen, Neshak for the middle stack and Smith for the far right. You can guess on ALL THREE! Simply comment with the player's last name and the serial number of the card. Closest to the actual number wins the stack. It's that simple. Yes, you may win all three if your guessing skills are amazing. And before you hunt for a cached version of the parallels page - these three cards were never listed, so close that tab and use your telepathic skills. I will let this giveaway run until Dec 11th at 5pm CST. I'll announce the winner that evening. One quick update about Tis the Season - I will ship when all the giveaways end and the card dump signup closes. So if you win something, just hang tight. I'll get all the cards out to everyone in January or February. Maybe March....who really knows. Besides my wallet. So, is that last number a 9? Maybe 4? Yikes. With my luck as of late, I probably just guessed three correct numbers, but in the wrong order. Honestly, I didn't even read this post, I'm just commenting in line with some of these comments, no idea why.. Awesome Jeff, Thanks for the fun!! !